Barbara Hodgdon is Professor of English at the University of Michigan and Ellis and Nelle Levitt Distinguished Professor Emerita at Drake University. Her previous publications include The End Crowns All: Closure and Contradiction in Shakespeare’s History (1991), The First Part of King Henry the Fourth: Texts and Contexts (1997), and The Shakespeare Trade: Performances and Appropriations (1998). She was guest editor for a special issue of Shakespeare Quarterly (2002) on Shakespeare films and is currently editing The Taming of the Shrew for the Arden 3 series. W. B. Worthen is Professor and Chair of the Department of Theatre at Barnard College. He is the author of The Idea of the Actor (1984), Modern Drama and the Rhetoric of Theater (1992), Shakespeare and the Authority of Performance (1997), Shakespeare and the Force of Modern Performance (2003), and Print and the Poetics of Modern Drama (2006). He is also the editor of several volumes, including the Wadsworth Anthology of Drama. 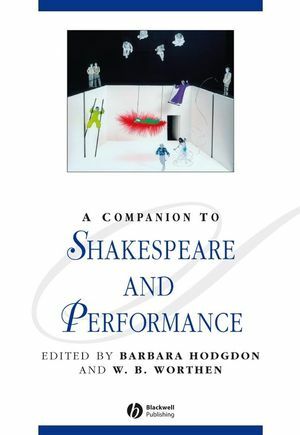 A state-of-the-art overview of the rapidly developing field of Shakespeare performance studies.